Our son was five when I started going to church. Now his daughter is almost five. 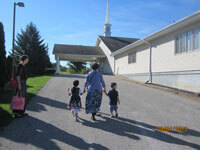 A few weeks ago, I walked up a slope with my grandchildren. They were skipping and looking around with excitement and enthusiasm. My heart was overflowed with joy and gratitude. Who could have imagined such a picture before 1989? Although I already fulfilled the American dream in my early thirties, something important was missing in my life. When my marriage and parenting did not work, I felt frustrated and depressed to the point that I secretly contemplated a divorce. I thought it was all my husband's fault that I was unhappy. You see, James promised to take me out to eat everyday before we got married (when I said I did not know how to cook). Why couldn't he love my child my way?! Thank God that my midlife crisis came early so that I evaluated where I was going. I wanted to live my own life (e.g. have things my way) and I also wanted a family with loving relationships! In the heat of the moment, I often forgot that my son was also James' son! It was a long path to find lasting love, hope and help. By asking myself some difficult questions and making some tough choices, I received a new life in Christ that has allowed me to relate to God, myself, and others differently, day by day, moment by moment. Determining how you are living is very important. It is your life after all. Do you feel frustrated about wasting your time and energy like a hamster running on the wheel like I did? Since my mom was unable to live her own life (that's another story for another time), she wanted me to be independent and take care of myself. She also warned me that I could not trust my husband completely (if I ever got married) or I would get hurt because "men are all the same." When our son was young, I often yelled at James when we disagreed. If he frowned at another new toy I bought, I would yelled, "It is my money! I can buy whatever toys he wants! It is none of your business!" When he withdrew from such one-way heated arguments, I felt abandoned and yelled, "You don't care!" Each of us were insisting that we were right, and it was the other person who needed to change. Unfortunately, when both of us reacted in defense, we were stuck in a negative interactive pattern. As our relationship continued to spiral downward, I was miserable and so was he. By the grace of God, we had a turning point, and learned that life was not completely our own. Jesus said, "The thief does not come except to steal, and to kill, and to destroy. I have come that they may have life, and that they may have it more abundantly" (John 10:10). Fulfillment in life is related to how well you are living in alignment with what's truly important to you as an individual. 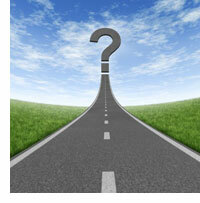 Do your decisions emerge from the essence of who you are -- not from who you think you should be? Take this quiz to see how well you are living a life that is of your own making. 1. I have spent time thinking about what's important to me, and I can articulate those things. 2. While I have been influenced by my parents, teachers, society and other outside forces, I have not simply adopted their values and beliefs. My own values and beliefs come from deep inside. 3. I am not easily swayed by others' opinions. I know my own mind. 4. In order to remain open and flexible, I am willing to re-examine my opinions and beliefs to determine whether something is still true for me. I am interested in other points of view. 5. My spouse/partner is a good match for me. We share in a way that pleases me and have an ideal amount of separate space. We don't have to agree on everything. 6. I chose my occupation, or choose to remain in it, because it most closely utilizes my skills, strengths and passions. 7. I also choose my friends. I don't go along with a friendship that doesn't feel right just because that person pursued me. 8. The spirituality I practice feeds my soul. 9. I have aspirations. I spend time thinking about them and taking action toward those that are most important to me. 10. Anyone looking at my life from the outside would see what I value. 11. When I or a family member is sick, I listen to the appropriate health care provider. If the advice doesn't feel right, I get a second opinion. 12. On the rare occasion when I let someone break a boundary or persuade me to do something I don't want to do, as soon as I'm aware of it, I take steps to stop and correct the situation. If you answered false more often than true, you may wish to clarify what is truly important to you and then find ways to bring your life into greater alignment with those values. Please don't hesitate to e-mail or call if you'd like support in doing this.